Detail from Bluebird of Happiness. Two summers ago, Jenifer Strachan completed a two-panel mural for a large wall in a new house on Lighthouse Road in Aquinnah. It had been conceived for clients for whom she had already designed eight-foot mosaics of Siamese cats for a balcony in New York, and she had been invited to “choose her wall,” which happened on a day when rain was pouring through the unfinished roof in torrents. Strachan’s tableau showed a young mermaid swimming with a small narwhal, which seemed particularly appropriate for the day as well as the site. The chosen medium, in which Strachan has won a wide reputation, was pique assiette – “stolen plates,” or more commonly, broken dishes – an ancient, and much later a modernist, form of mosaic art. 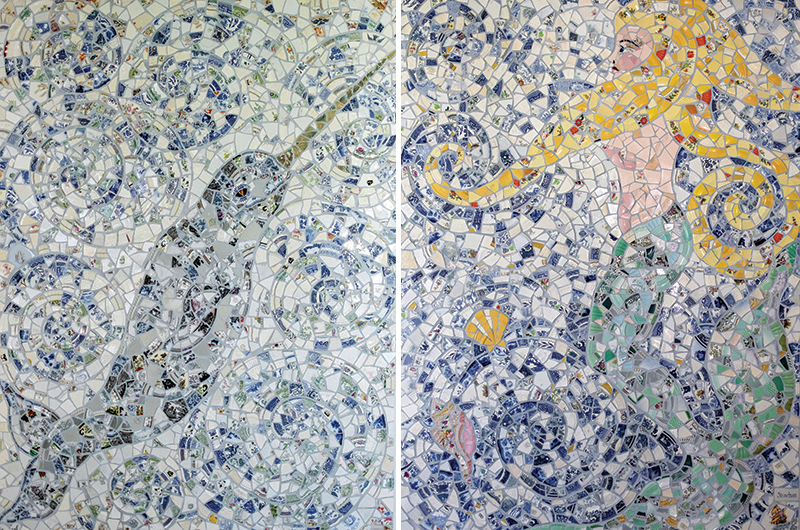 In the way that Roman artisans captured rich scenes of daily life in floor tiles, Strachan had created an image of a mythical moment in the sea with a thousand shards of pottery – blue and white for the water and the narwhal, yellow and green for the mermaid. The pieces curve and shimmer, suggesting movement and evoking a sense of wonder. Strachan, who describes herself as a self-taught artist, bears a certain resemblance to a mermaid – she has a pretty face framed by long, curly hair, likes to swim, and frequently dreams about whales. She grew up in an artistic family on Hines Point on the Lagoon in Vineyard Haven and was an early beachcomber and collector of treasures – jingle shells to make a lampshade, sea glass as jewels. “One thing leads to another,” Strachan says, which is the way her own art found its direction. When she was a graduate student in nutrition at the University of Massachusetts–Amherst, Strachan made jewelry out of old charms, buttons, and semi-precious stones, which she sold to her professors and, in the summer, at the Chilmark Flea Market on the Mememsha Crossroad. On a first trip abroad to Barcelona, she was dazzled by the work of the legendary architect Antoni Gaudí and the art nouveau mosaics with which he encrusted façades, rooftops, sidewalks, and benches in the city. A year later, she created her first large-scale mosaic with fragments from her collection of old dishes for a sculpted fifty-foot bar in a friend’s new restaurant in Northampton, called Spoleto. It pictured a festival of mermaids, musicians, food, and wine. Strachan inside her West Tisbury studio. In the 1990s, as word of her art began to spread, Strachan’s life became a progression of commissions and gallery shows: a stage set for a production at The Yard; wall mosaics for two Vineyard restaurants; a stained glass transom window featuring a bluefish for a house on East Chop; a quartet of reflecting pools, representing the four seasons and designed with the landscape architect Michael Van Valkenburgh for the Cheekwood Estate and Gardens in Nashville, Tennessee. There were exhibitions at the Field Gallery and at the old Etherington Fine Art gallery on the Island, and a handful of shows in New York, New Orleans, and elsewhere. During many winters in South Florida, beginning in 2000, Strachan worked as a photographer, exhibited her mosaics, and also began to teach workshops in the medium, which gave her a deeper understanding of her own work. They were happy days, filled with long beach walks where she would find exotica like the remnants of old china dolls washed up from early shipwrecks. But these days she is content to be back at home in West Tisbury, tucked deep into the woods on the road to Long Point. Her studio, a simple ten-by-twelve-foot structure that was built with the help of friends and the earnings from the reflecting pools commission, is her sanctuary. Still aromatic from its walls of green pine, planted on high ground and centered on a wide window down into the oaks, it feels like a tree house, and it is filled almost to capacity with the raw materials of her mosaics – plates, bowls, cups, and teapots of many colors and many patterns stacked on counters, shelves, and floor – her “palette,” as she calls it. Her pieces are old, dating from 1940 back as far as the late eighteenth century: “found objects” from thrift shops, yard sales, beaches, and travels, as well as the almost daily gifts from friends and clients. Strachan surmises that she may spend as much time collecting as she does creating. Dishes evoke memories for her; she recognizes patterns and infers their history. She likes allegory and sees a promise in her finds that she wants to honor. As her art has become more refined and her eye more selective, Strachan has remained consistent in her commitment to work only with pottery – “never tiles,” she says adamantly, although occasionally she might slip in a seashell – and to cut her pieces by hand with tile nippers, which is very exacting. “Smashing would be wasteful, and besides,” she says with a grin, “I don’t like loud noises.” Strachan sketches her designs on paper in pencil before she cuts and matches fragments to her vision, paying particular attention to the space between fragments, which is significant, as well as to the flow of the whole composition. She labors over the faces she creates – “the eyes are important because they make people respond” – and finds in tiny components with patterns the makings of seductive eyelashes or interesting eyebrows. The painstaking and delicate nature of her work is obvious even when photographed – the birdbath inlaid with bits of flowered pottery and lusterware dragonflies that sparkle, or a four-foot portrait of mythical Lilith, the Biblical demoness, composed of rosebud shards and enveloped by a long black snake. The Ocean Studies Board photographed her intricate mosaic of a North Atlantic right whale for the cover of its 2017 annual report. The two panels of The Mermaid and the Narwhal on Lighthouse Road. Each mosaic measures 54 x 72 inches. English ironware, which she favors; Staffordshire; her grandmother’s willowware – also makes its statement. 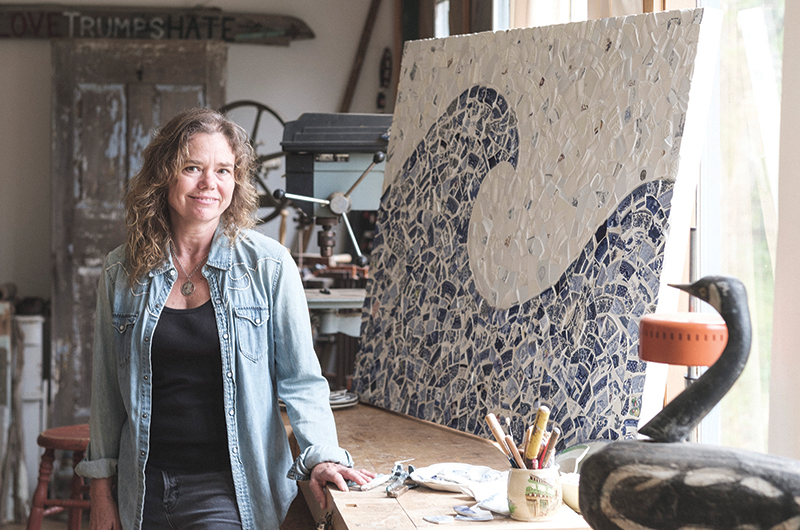 In the present, Strachan has been focused on installations as elaborate as the ten-by-twelve-foot, two-panel mural in Aquinnah, or the White Pony mosaic that wraps around four walls of a Chilmark kitchen, and as simple as a backsplash made of stone and shells that she has been creating for a bathroom in an Oak Bluffs cottage. She is pleased with the diversity of her commissions and loves the notion of adventure. She is a deep-down Island girl whose sources are clear and whose art is full of memory and light. In that art, as in mosaic art as a form, there is a hint of magic and a sense of vision – something small growing into something big, something old refashioned to become something newly illuminating. Seated at her desk, Strachan studies a seascape that is in progress on her staging table. “There’s a lot going on in there,” she says in a way that is both matter-of-fact and happy.